The Arsenal. How did it all start? Well as a very young nipper my parents split and my mum relocated up north to West Yorkshire, near Huddersfield, so naturally I had to go with her. So as I settled in I actually supported Liverpool, easy thing to do right? Seen as though it was around 1984. I remember my mum even buying me Dalglish Silver Puma boots around my 6th birthday, god I feel dirty thinking about that now. Luckily this folly was only temporary. I used to see my dad back in Royal Oak every 3 weeks, and on this one occasion circa 1985/86, we had a conversation on my chosen football team. ‘Come on son support Arsenal like your dad’ my response ‘but Arsenal are rubbish dad, Liverpool are the best’. The conversation continued as we walked under the A40 flyover from Royal Oak Tube to which I said ‘alright dad, I’ll support Arsenal like you’. And that was it, the changeover was complete and didn’t take much persuading. A boy should follow in his dads footsteps when it comes to football, well in my opinion anyway. So in the following years as I grew older as visited my dad, he’d often take me to Highbury (RIP) and the odd away game. Never forget going to Highbury in close season 1986/87 to the Avenell Rd club shop. As we walked up the road I had a peek though some of the exit gates on to the pitch, a very sandy one at that and low and behold someone saw us and invited us into the ground. So in we went and there was the Littlewoods Cup in all its glory, couldn’t believe my eyes!! Luckily my dad had his camera so we stood on the pitch facing the East Stand we had a picture of us holding the Littlewoods Cup, Christmas had come bloody early that year!! Arsenal soon became a drug that I was totally hooked on, always on teletext for news, checking sports bulletins on the radio and being first to the door when next weeks Pools arrived so I could see who we was playing. 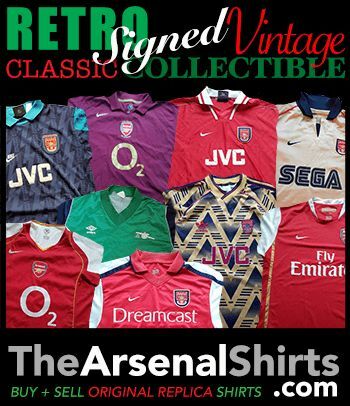 As well as all the kits and tracksuits, late 80’s was a great and excited time to be a young Arsenal supporter. This never eased off as grew into my teens. I started going more with my mates and then my love for the clobber and a few matchday drinks soon took hold, the matchday view took a new but just as excited turn. Now I’m in my mid 30’s admittedly I don’t go anywhere near as much. I have a young family to bring up and add to that, that Highbury is no more and plus sky high prices. It doesn’t leave my with the urge to go, I’ll always love the club like I did back as a nipper but going just isn’t the same anymore. But next week for Southampton my next chapter supporting The Arsenal starts, I’m taking my 5 year old son to his first ever game. I’m not sure who’s giddier, me or him? So the Arsenal journey starts all over again…. This entry was posted in Arsenal and tagged Arsenal, Arsenal FC, Christmas, Football League Cup, Highbury, Huddersfield, Liverpool, West Yorkshire on November 18, 2013 by norbyafc.